24 FLEX007 MAGAZINE I APRIL 2018 alent in standard prepreg would be $7.50. These costs can add up pretty quickly, even for basic low-layer-count designs. With high-layer-count designs, the cost impact is even more profound. If your design is primarily half-ounce and/or one-ounce copper weights, we will usually use 1080 glass styles, which are lower in cost. If your design has two- ounce or three-ounce copper weights, we will use the 106 glass styles, because of their slightly more favorable flow characteris - tics, but they cost 50% more than the 1080 prepreg. Using multiple plies of 106 to fill the thicker copper weights can drive up the panel price very quickly. 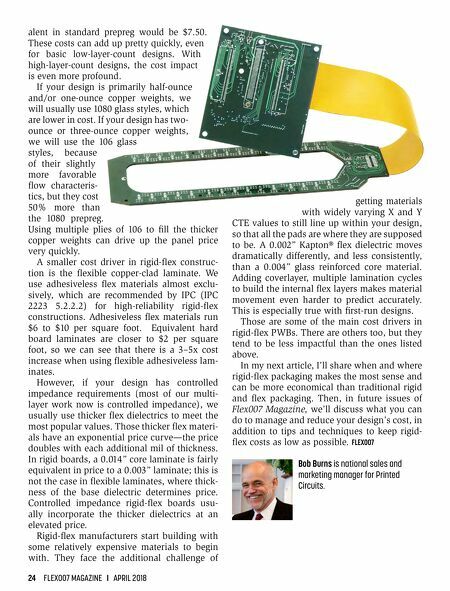 A smaller cost driver in rigid-flex construc- tion is the flexible copper-clad laminate. We use adhesiveless flex materials almost exclu- sively, which are recommended by IPC (IPC 2223 5.2.2.2) for high-reliability rigid-flex constructions. Adhesiveless flex materials run $6 to $10 per square foot. Equivalent hard board laminates are closer to $2 per square foot, so we can see that there is a 3–5x cost increase when using flexible adhesiveless lam- inates. However, if your design has controlled impedance requirements (most of our multi- layer work now is controlled impedance), we usually use thicker flex dielectrics to meet the most popular values. Those thicker flex materi- als have an exponential price curve—the price doubles with each additional mil of thickness. In rigid boards, a 0.014" core laminate is fairly equivalent in price to a 0.003" laminate; this is not the case in flexible laminates, where thick- ness of the base dielectric determines price. 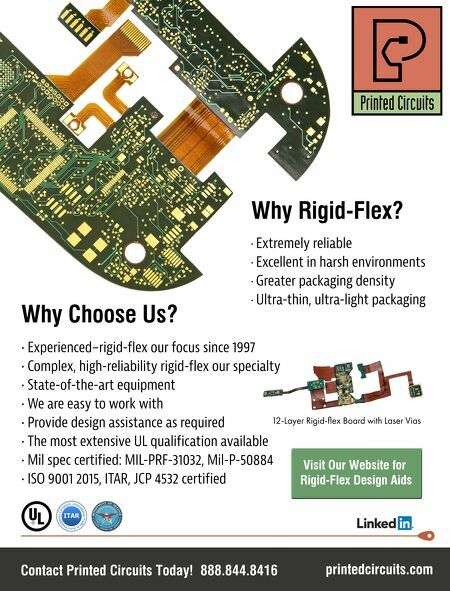 Controlled impedance rigid-flex boards usu- ally incorporate the thicker dielectrics at an elevated price. Rigid-flex manufacturers start building with some relatively expensive materials to begin with. They face the additional challenge of getting materials with widely varying X and Y CTE values to still line up within your design, so that all the pads are where they are supposed to be. A 0.002" Kapton® flex dielectric moves dramatically differently, and less consistently, than a 0.004" glass reinforced core material. Adding coverlayer, multiple lamination cycles to build the internal flex layers makes material movement even harder to predict accurately. This is especially true with first-run designs. Those are some of the main cost drivers in rigid-flex PWBs. There are others too, but they tend to be less impactful than the ones listed above. In my next article, I'll share when and where rigid-flex packaging makes the most sense and can be more economical than traditional rigid and flex packaging. Then, in future issues of Flex007 Magazine, we'll discuss what you can do to manage and reduce your design's cost, in addition to tips and techniques to keep rigid- flex costs as low as possible. FLEX007 Bob Burns is national sales and marketing manager for Printed Circuits.